If you’re on the lookout for a smart thermostat this Black Friday, you don’t have to wait another minute because the best thermostat deal of the season is already here. 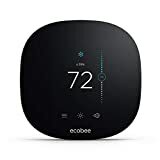 The ecobee3 lite Smart Thermostat is already ecobee’s most affordable smart thermostat, and now it’s back on sale at its lowest price ever. Just $139 is all you’ll need to pay to potentially save hundreds on your energy bill each year. There is definitely a chance this deal will sell out though, so grab one soon if you want to guarantee you’ll get one. WORKS WITH ROOM SENSORS: Place them in the rooms that matter the most and have the temperature balanced throughout your whole home. Measuring both occupancy and temperature, sensors signal your ecobee Smart Thermostat to automatically switch to the right mode for comfort when you’re home or for savings when you’re not. 2-pack sold separately.